Last week the classes competed against each other once a day to earn points. Monday’s competition was a crossword puzzle. The next day a male and female from each class completed an obstacle course. Wednesday two students raced to be the first to be dressed in basketball clothes, make a layup and race down the court. On Thursday, the final day of competition, the entire classes tried to solve seven riddles. After the competitions, the class that came in first was the juniors with 511 points, second place was the freshmen with 474 points, third place went to the seniors with 378 points, and the sophomores were last with 318 points. Friday each class got four hours to work on their class float. Each float had to include secret elements that Pep Club sponsor Summer Younie picked for them, so the kids would have to use their imagination. The floats were voted on by patrons attending that night’s game. The junior’s got the the most votes. “My favorite part was working on the float together and trying to figure out how to use all of the secret ingredients,” sophomore Drew Thornburg said. At the homecoming assembly, the court was announced and classes competed in skits. “My favorite part about being in homecoming was walking in the gym at half-time of the boys game with my dad,” sophomore attendant Emily Estes said. After the votes were counted, Katherine Ghumm won homecoming queen, and Layton Kenworthy won king. 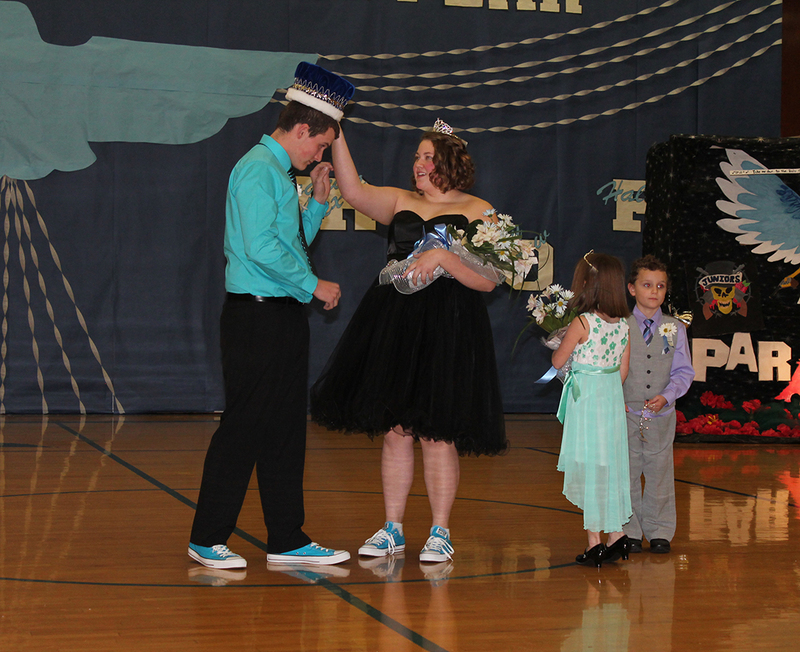 Skyline High School King, Layton Kenworthy and Queen, Katherine Ghumm claim their new title. The first grade attendants were Jackson Piester and Raven Cason. “It was really fun and exciting to win homecoming queen, but it was strange to have people calling me queen afterwards,” Ghumm said.